Connecticut’s Beardsley Zoo recently welcomed two new family members. A pair of Emperor Geese joined other feathered friends in the outdoor aviary. ​They are diurnal birds that lead sedentary lives when not migrating. They are quieter than other geese species, although they do quack and “honk” when flying. They gather in small family groups, but during breeding and molting seasons they form larger flocks, with the non-breeding geese forming a separate flock. Emperor Geese are small stocky birds. They have dark barred plumage on their bodies with white tail feathers. They have white heads and a short pink bill. They have orange legs. During breeding season, some adults will have orange-colored heads and necks rather than white. This is due to iron oxide concentration in tidal areas. They are approximately 2 to 3 feet long. They weigh between 4 and 6 pounds with the female being slightly smaller than the male. They have a four-foot wingspan. They have excellent vision but when seeking mollusks in muddy water they rely on their sense of touch. Emperor Geese fly lower than other species of goose but they have faster wing beats. When threatened on land, they usually run toward water and swim to a safe distance. They typically nest in open sites in arctic tundra during the mating season, either near inland lakes, coastal lagoons, or freshwater pools. In winter, they are mainly found on ice-free coasts. 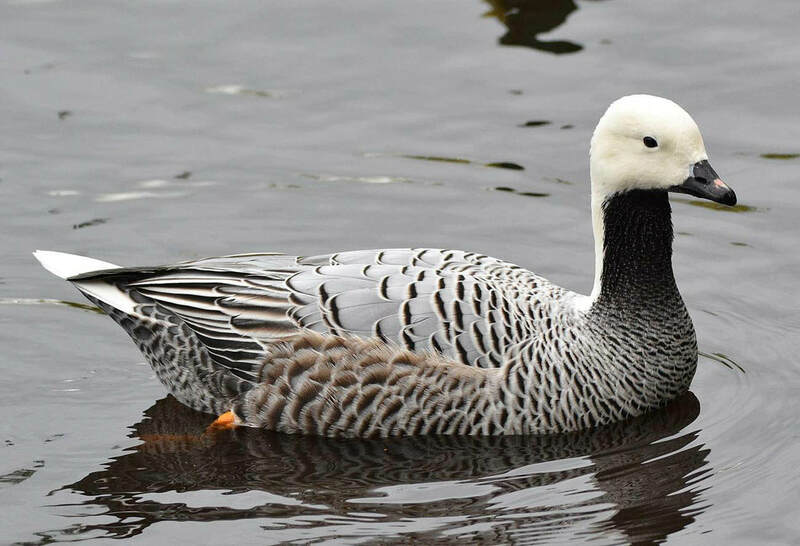 Emperor Geese have a range that centers on the North Pacific Ocean in the Bering Sea. They breed in sub-Arctic and Arctic Alaska, Canada, and along Russia's northeastern coast. Omnivore – the bulk of their diet is that of an herbivore, so they eat mainly by grazing for grasses, berries, seaweed and algae. They will also eat mollusks and crustaceans during the winter spent on the coast. Emperor Geese are monogamous and will only seek out a new mate if a mate dies. The female called a goose) builds a nest in a shallow depression on the ground lining it with feathers, down and grass. The male (called a gander) does not help build the nest but he defends the nest. An average of 5 eggs are laid. The female incubates the eggs until they hatch. Upon hatching, the chicks (called goslings) are precocial which means they are well developed and able to feed themselves almost immediately. The young goslings usually leave the nest on the day that they hatch. They can walk and swim within hours of hatching, but they stay close to the parents for the first two months. An Emperor Goose will not mate until it has reached at least three years of age. And even then only 1 out of every 10 goslings survive the first year of life. Up to 12 years in the wild. Up to 25 years in human care.